OneDrive for Business (OdfB) (Part of Office365) is now getting to the stage where it is a feasible choice/alternative solution to on-premise storage. 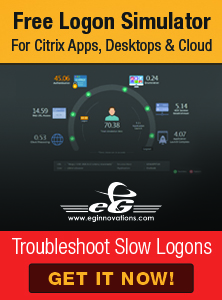 But from a Citrix/RDS based solution there are still challenges. Below gives an overview of the limitation challenges and possible workarounds/alternatives. Windows Explorer displays the first 35 characters of a site library’s name and site name combination for a library that you have synchronized. This doesn’t affect the ability to sync these items within the limits that are described in this article. The application must be installed on the local computer. The user must be able to write to the user profile. Data that’s written to the user profile must be saved to the local hard disk and be available without a network connection. UPDATE: As per my blog post OneDrive Files on Demand feature announced on Windows 10 update later in the year. Microsoft are to launch a OneDrive client on-demand with local cache for Windows 10 (it is not clear if it will be seperatley available for Windows Server 2016/XenApp RDS environments. The Script can be obtained from the Microsoft Gallery by Clicking Here (with thanks for Jos Lieben who all credits must be given to the development of the script. I have also tested this on Windows Server 2016 Standard Edition (Desktop Experience). The only downside of the powershell script is the length of time to round which based on some initial testing takes 30-60 to complete which would need to be added to the login time if it where to be run every login, maybe less if cookies/network drive is not cleared during logoff. LIMITATION : – A WebDAV mapped drive’s capacity is set to match the client machine’s System drive capacity. This means that the capacity you get from a WebDAV mapped drive is the same as your local System drive. System drive is where Windows is installed. 3.Map a library to a network drive. This clears up the supportability of the Drive Mapping. My Conclusion is that it is a supportable solution, although would need to be confirmed by Microsoft. Citrix workaround is deploy a ShareFile client which have a Office365 connector, this is detailed in the below Deployment guide. My opinion on this is that although a workable solution recommended by citrix , it requires a ShareFile license (additional expense) and the uploading files limitation rules it out in many user based scenario’s. Access their files via the web browser. This to me would be the least user acceptable solution of them all. I would strongly recommend using your voting within the below site to request support for RDS support on the next release of the client. Again , my opinion is that although this is all online, the downloading/uploading of files will be a unwanted various for normal opening/saving of files within standard file systems. OneDrive and OneDrive for Business – Enable OneDrive for Business in XenApp and XenDesktop. Roam OneDrive user data seamlessly in every virtual desktop environment without the need to resync at each logon. This is a subscription based product so additional cost would be required , but going by what is advertised it really is a game changer for how profiles are managed in a XenApp/XenDesktop environment. NOTE: i have requested a trial to evaluate and will blog my finding/experience/How-to guides etc. UPDATE: 10/05/2017 – A initial review of the product FSLogix Office365 Containers to the rescue! Next FSLogix Office 365 Container – Is Full Cached mode now possible? Send me a demo and i will certainly have a look at the product.